Wayne was born in 1958 and raised in Windham, Ohio. At seventeen, he joined the military. He served in the U.S. Navy for six years, from 1977 to 1983. He was stationed in Mayport, Florida, and served overseas as well. When he got out of the navy, he gained experience in multiple fields. He has worked a variety of jobs, ranging from being the assistant manager of a Circle K convenience store, to semi-truck driver for Mayflower, to performing maintenance on carnival rides. While working on carnival rides, he suffered a serious ankle injury. The medical bills piled up, and he lost his home. In 2012, Wayne went to Atlanta Mission, formerly Atlanta Union Mission, and in 2013 United Way came to help out veterans. They connected him to Homes of Light. Shortly after, Wayne became the house manager for one of their properties, and is now HOL’s head mechanic. 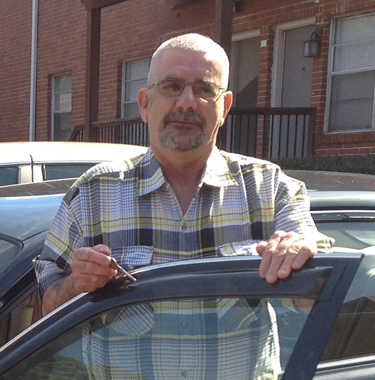 Wayne worked with their VetCar program and purchased a car with the assistance of their no interest loan. Wayne has worked hard to overcome his situation, and is looking forward to retirement, owning his own home, and continuing to better himself.